Tallahassee, FL—The United States does not fund terrorist groups mainly because the United States is well aware that any funds provided to them will more than likely further their influence to attack America. Terrorist groups are a threat to Americans life, freedom, and liberty. The most common pre-war tactic used by the United States to prevent a full onset war is to cut off all funding to countries that pose a threat and/or not provide any funding at all to terrorist groups. For nearly three years, DeShon Thomas’ mother begged Governor Scott and Attorney General Bondi to assign a special prosecutor to the double murder case in which DeShon was the lone defendant. The reason for the begging was due to the double murder case, which began on January 27, 2011, being investigated by Leon County Sheriff Larry Campbell and then Second District State Attorney Willie Meggs, assigning the case to be prosecuted by Assistant State Attorney Jack Campbell. Leon County Sheriff Larry Campbell and Assistant State Attorney/Prosecutor Jack Campbell are father and son. DeShon, who was a 17-year-old freshman at Tallahassee Community College and employee at a local fast-food restaurant, was charged and arrested based on incriminating statements said to have been made by a disgruntle male friend. DeShon, who entered a plea of Not Guilty, was up against a father and son investigating and prosecuting team. When DeShon’s mother learned that this “Team” was not considered unethical and was told that the “Team” did not pose bias against DeShon, that’s when DeShon’s mother began to beg for a special prosecutor to be assigned to the case. Grant it DeShon’s mother was not the defendant, but her actions were requested by her son, DeShon—as well as those of nature. As DeShon’s case went fast forward down the path of malicious prosecution, DeShon’s mother learned that the defense attorney that she hired, Mr. Cummings, had conspired with Circuit Judge James C. Hankinson and State Prosecutor Jack Campbell to deny DeShon a fair trial. As DeShon’s private attorney, Mr. Cummings failed to disclose simple information that could have gotten DeShon exonerated. Key pieces of evidence such as DeShon’s AT&T cell phone records and the two victims’ autopsy reports. According to court records, before DeShon was ever charged with the two murders, the Leon County Sheriff’s Office received and reviewed DeShon’s AT&T cell phone records. Upon reviewing DeShon’s AT&T cell phone records, the Leon County Sheriff’s Office filed a Motion to have DeShon’s AT&T cell phone records Sealed by Court Order. The motion was immediately granted by Leon County Judge Ronald Flury. DeShon’s mother had paid Mr. Cummings nearly $30,000—Mr. Cummings refused to file the necessary court document to have DeShon’s AT&T cell phone records UnSealed. Instead, in an attempt to deceive DeShon and his mother, Mr. Cummings provided DeShon’s mother with an excel spreadsheet that had been created by Leon County Sheriff’s Criminal Analyst Leslie Rabon. Mr. Cummings was fired. As DeShon’s mother continued to beg Governor Scott and Attorney General Bondi to intervene, those elected officials and other judicial officials such as, Circuit Judge Hankinson, Circuit Judge Jackie Fulford, State Attorney Willie Meggs, Public Defender Lead Nancy Daniels, State Prosecutor Jack Campbell and his dad, Leon County Sheriff Larry Campbell and some of Sheriff Campbell’s Deputies and DeShon’s own court appointed Regional Counsel, Daren Shippy, continued to conspire against DeShon. So much so, that documents containing false information was filed with the Leon County Clerk of Courts. It was bad enough that Leon County Sheriff Larry Campbell allowed his wealthy personal friend, Mr. Don Odham, to act as a Leon County Sheriff’s Detective, when in fact Mr. Odham was not even on the payroll–and was far from being qualified to be a Leon County Sheriff’s Detective. It was Mr. Odham’s wanna-be detective—as to what led to DeShon being charged with the murders. According to court documents, Mr. Odham, who is being referred to as Leon County Sheriff’s Detective Odham, also participated in searching the inside of the victims’ townhome—which was the crime scene. Neither Mr. Odham nor the disgruntle friend whom Mr. Odham claimed provided incriminating statements directly to him were ever deposed. 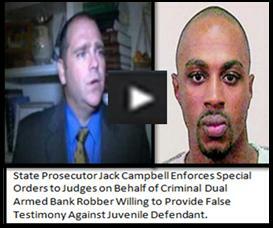 In October 2013, Circuit Judge Jackie Fulford knowingly allowed the jury to hear perjured testimony in order to ensure State Prosecutor Jack Campbell received a conviction. DeShon, who was being represented by Regional Counsel Daren Shippy, had long had his rights violated by the Office of Regional Conflict and Criminal Counsel’s Office, which is under Regional Counsel of the First District, Jeffery Lewis. Despite all of the corruption, and getting DeShon convicted and sentenced to Two Life Sentences plus 30 years, Florida State Agencies are still not satisfied. Former Lincoln High School special education student, Anthony Goss, was sixteen years-old at the time of DeShon being charged with the murders. Anthony Goss, a stand out in among Special Olympic Athletes of the Big Bend, is the cousin of DeShon’s. Anthony Goss has received several metals and awards for his outstanding accomplishments in sports and in school. Natives of Orlando—in 1995, when DeShon’s mother was 23-years-old, Anthony’s mother (DeShon’s mother’s older sister who was mentally disabled) asked DeShon’s mother to care for Anthony. Anthony was born HIV positive. At the time, DeShon’s mother had two sons of her own, was living with DeShon’s dad and was also attending Valencia Community College in Orlando, where she was pursuing an Associate in Arts Degree in Paralegal Studies. Anthony, who was born HIV positive, was nine months old at the time—he would have gone into a Florida foster home had DeShon’s mother not taken him into her home. While early medications given to Anthony as an infant helped Anthony’s immune system shed the HIV virus out of his blood system, about two years after DeShon’s mother received Anthony into their home, Anthony’s mother succumb to AIDS—leaving behind Anthony and two older children. Anthony was diagnosed as Educable Mentally Handicapped. Because of Anthony’s disability, Anthony qualified to receive financial and medical benefits through Social Security Supplemental Income. It is Anthony’s Social Security Supplemental income in which has been threatened to be discontinued. After DeShon’s mother filed a complaint with the Florida Department of Health against Associate Medical Examiner Dr. Anthony Clark for committing perjury during DeShon’s trial—DeShon’s mother has received several acts of intimidation. Discontinuing funds to Anthony will hurt Anthony. Although DeShon’s mother is Anthony’s representative payee, their household bills are pretty much divided to benefit Anthony—and it has always been that way. No amount of money could compensate DeShon’s mother for the sacrifices that she’s made—not for just her sons but the children of others. DeShon’s mother, who ended up dropping out of college to care for her family, could only raise someone else’s children—children with special needs—through love—not the love of money. DeShon, himself, had more than enough love—but didn’t realize it—which is common for a teenager. The only thing DeShon is guilty of—is befriending those who received little to know love in their own homes. DeShon cared more about his friends than their parents—particularly the two that he’s been convicted of murdering—that’s mainly why the Leon County Sheriff’s Office motioned to have DeShon’s AT&T cell phone records Sealed. Acting in their haste to want DeShon to be the murderer—the Leon County Sheriff’s Office wanted to show that DeShon was angry with the female victim and had stopped communicating with her due to her pregnancy—stating that DeShon didn’t want to be a father. THE LEON COUNTY SHERIFF’S OFFICE WAS WRONG! Not only will DeShon’s AT&T cell phone records show that DeShon and the female victim were constantly communicating—and were friends—the female victim’s medical records and statements from relatives reflect that DeShon wanted to be a father. That is why after DeShon had been in the Leon County Jail for nearly a year, State Prosecutor Jack Campbell set out to make the double murders gang related. DeShon did not commit the murders. The war tactic—the cutting off of funds to Anthony with the belief that DeShon’s mother will be silenced—is worthless! No parent should ever let money stop them from speaking the truth. DeShon, who was a child, expected a fair trial—and the State of Florida LIED on a child. Currently, the State of Florida—Tallahassee, is being run by a bunch of elected LIARS! Whatever “Threat” those LYING officials believe that they’re under—it’s one that they, themselves created.